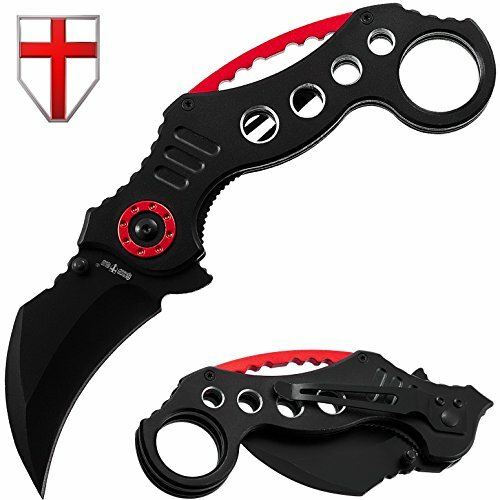 The GrandWay 10417 model is a beautiful and unusual full metal folding karambit knife with the blade resembling a claw. The hawkbill, stainless steel blade has a flipper, thumb studs, and a black oxide finish. The handle is made of black aluminum and has a finger ring. For the knife both forward and reverse grip is typical, thus for the best retention you may put your index finger or thumb in ring which obviously fit in there and even in winter in the glove. Reverse grip is mainly used in self-defense. Technique is designed primarily for intersecting strokes. The handle of the knife is 2 steel liners connected with screws and remote stack bolts. It has a series of round holes, which are not only an element of design, but also lighten the handle. The ergonomic shape provides a very comfortable and stiff grip. There is a single clip of medium hardness for carrying on the pocket. The liner lock is used as the locking mechanism. It is very simple and undemanding lock which allows closing and opening the knife with one hand. The spontaneous folding of such a lock is simply out of the question. Karambit knives (also known as kerambit, carambit or cerambit) are applicable for civilian purposes and will perfectly cope with the cutting of cardboard, rope, tapes and so on. Magnificent appearance combined with compactness makes of this knife a perfect gift. FOLDING KARAMBIT KNIFE WITH POCKET CLIP. Sharpeninng is performed on the iner part of the blade. Equipped with the thumb studs for easy opening. Forward and reverse grip is possible. BLACK PAINTED 440С STAINLESS STEEL - excellent balance of hardness and corrosion resistance ensures proper operation without sharpening. Provides razor sharp cutting performance and high durability. BEAUTIFUL AND UNUSUAL DESIGN WITH RED METAL INLAYS - a very powerful crescent curved blade and a ring at the end of the handle holed for weight lighting. It is a great tool for both professional and tourism lovers alike.